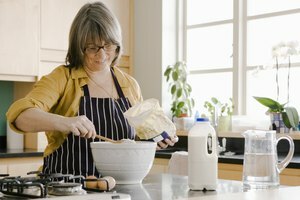 If you browse through a random handful of baking-related cookbooks and websites, you'll find any number of recipes for glazes, icings and frostings. Some of them are insanely elaborate and require a high level of skill and experience to execute confidently. 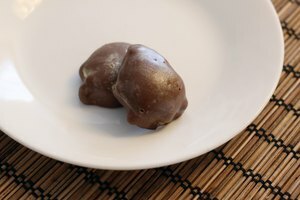 A simple icing sugar and water glaze, sometimes called "flat icing" or "glace icing," falls at the opposite end of the scale. It couldn't be easier to make, and it's versatile enough to use on a wide variety of cookies, pastries and cakes. With a pastry sifter or wire mesh strainer, sift the confectioners' sugar into a mixing bowl. Press it through the mesh carefully to remove any lumps. Stir in the water or other liquid and the vanilla, if you're using it, to make a thin and pourable glaze. It should be smooth in texture, thinner than pancake batter, but thicker than heavy cream. If the mixture is too dry, add a few drops of water at a time until if flows freely. If the mixture is too wet, sift in a bit more confectioners' sugar. Use the icing immediately or store it in the mixing bowl with a sheet of plastic wrap pressed directly to the surface of the icing to keep it from drying out. Replace the water with milk or light cream for a richer version of the same icing. Swap out the vanilla for almond extract, rum extract, mint extract or any similar flavoring, choosing one that's compatible with your main recipe. Alternatively, dissolve a small quantity of instant coffee or espresso powder in your liquid to make a coffee-flavored glaze. Replace the water with lemon juice or other fruit juices to make a tangy glaze for pastries, donuts or coffee cakes. Add cinnamon or other warm spices to the glaze if it's going to be used on a cake with compatible flavors. Substitute cocoa powder for part of the confectioners' sugar to make a chocolate version of the glaze. This recipe makes enough icing for a dozen normal-sized cookies or small cupcakes. For larger cookies, loaf cakes or doughnuts, double the recipe. 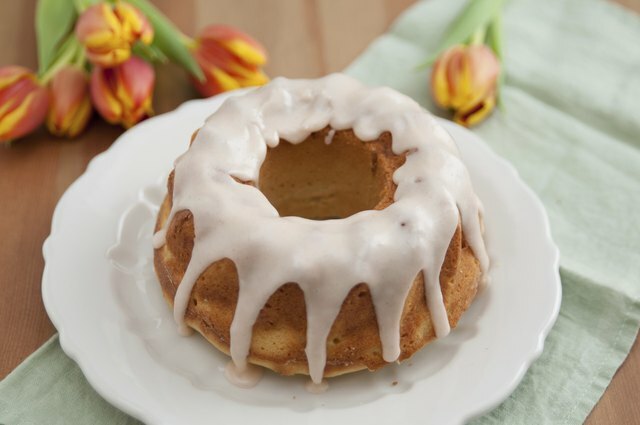 For a full-sized Bundt pan or other ring cake, quadruple it. If you're going to use the icing for cookie decorating, make one of the larger-sized batches and divide it between multiple smaller bowls. Add a few drops of food coloring to each bowl to make a suitable selection of seasonal colors to suit your cookies. At Christmas, red and green are in demand, while at Easter, you'll probably want cheerful yellow and pastel blues and pinks. There are several ways to use this icing. You can dunk cookies or cupcakes directly into the bowl of icing so their surface is covered, then turn them right-side up and set them on a wire rack to drain and dry. You can use a spoon to drizzle the icing over cookies and pastries, making lines or zigzag patterns as you go. 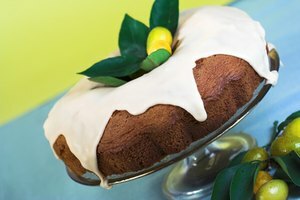 For a large Bundt cake, pour it carefully over the top of the cake so it drizzles attractively down the sides. For intricate designs, use a pastry bag with a fine tip or fashion a decorating cone from parchment paper.